The IOSR Journal of Pharmacy (IOSRPHR) is an open access online & offline peer reviewed international journal, which publishes innovative research papers, reviews, mini-reviews, short communications and notes dealing with Pharmaceutical Sciences( Pharmaceutical Technology, Pharmaceutics, Biopharmaceutics, Pharmacokinetics, Pharmaceutical/Medicinal Chemistry, Computational Chemistry and Molecular Drug Design, Pharmacognosy & Phytochemistry, Pharmacology, Pharmaceutical Analysis, Pharmacy Practice, Clinical and Hospital Pharmacy, Cell Biology, Genomics and Proteomics, Pharmacogenomics, Bioinformatics andBiotechnology of Pharmaceutical Interest........more details on Aim & Scope). International Organization of Scientific Research (IOSR) is a registered independent organization, IOSR supports and services to education professionals and researchers around world, especially those from the developing countries.IOSR is the association of Scientists, Research scholars, Professors, Directors, Managers, Engineers, Pharmacy persons of various fields like Engineering, Management, Pharmacy, Applied Science, and Mathematics. IOSR helps the researchers free of cost by providing right direction in their research with the help of its worldwide research association members. 30 April 2019 IOSR PHR April 2019 Issue ( Volume 9, Issue 4 ) has been released. 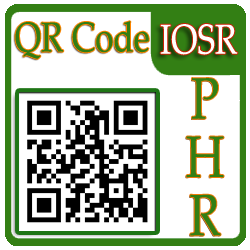 10 May 2019 IOSR-PHR has successfully indexed in Crossref. 10 May 2019 IOSR-PHR has indexed in NASA ads.